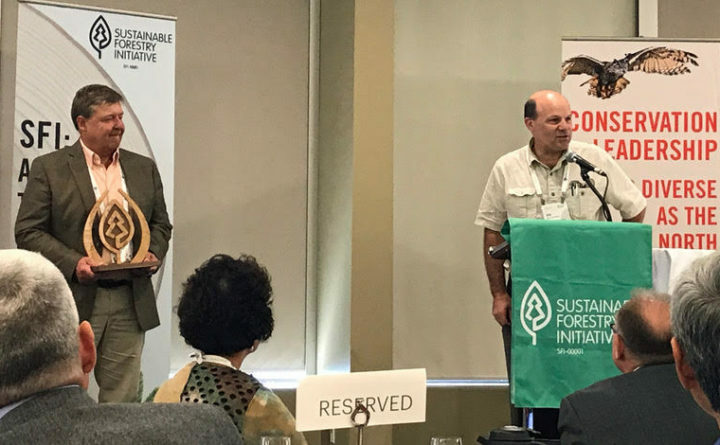 The Sustainable Forestry Initiative Inc. (SFI) announced today that the Maine SFI Implementation Committee is the winner of the 2017 SFI Implementation Committee Achievement Award. This award, announced at the SFI Annual Conference, recognizes the exceptional work of the grassroots network of 34 SFI Implementation Committees across the U.S. and Canada. Groups ranging from Habitat for Humanity and Boy Scouts to universities and Ducks Unlimited Canada work with SFI Implementation Committees. “The Maine committee exemplifies SFI’s connection with environmental education, community engagement, and outdoor recreation for all,” said Kathy Abusow, president and CEO of SFI Inc. Education outreach highlights from 2017 included an expanded flume table program. The flume tables are sandboxes about the size and height of a kitchen table. They started out as a teaching aid to demonstrate natural stream functions. They have evolved into an effective SFI outreach tool to raise awareness of sustainable forest management, and best management practices for water quality. Support for Make-A-Wish Maine brightened the lives of two boys. For 13-year old Kyan MacDonald, a cabin delivered to his home is a dream come true. “Kyan’s Kabin,” complete with two lofts, built-in storage and windows letting in plenty of light, was unveiled as a surprise on August 9. Kyan was diagnosed with acute myeloid leukemia and is now in remission.